Uglyworld #1876 - The Lasts Packeter - (Project Cinko Time - Image 83-365), a photo by www.bazpics.com on Flickr. It didn't takes us long to emptiers the supplies cupboarder where we had keepereds all the tastiers goodies we pickered up in the Uniteds Kingdomer earliers this month. 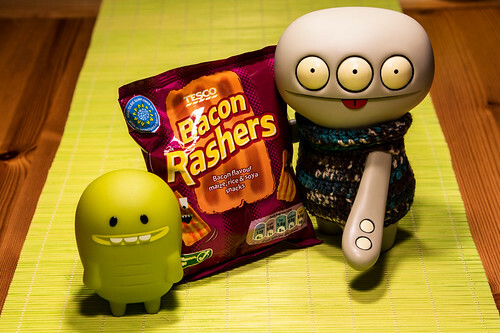 I decidereds to shares the lasts packeter of bacon rasherers with my gooders buddy Turtle, as long as doesn't scoffs more than his halfs of the packeter!